Everyone wants to have a dazzling white smile, but the truth is, a lot of things we do every day can take their toll on our pearly whites. Whether it’s the coffee we drink every morning or the glass of red wine we relax with at night, many common foods and drinks can stain our teeth over time, making them look dull or discolored. 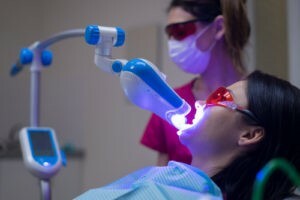 Our Chester dental office wants you to know that there are ways to transform your smile and whiten your teeth. The best way to figure out the best way to whiten your teeth is to schedule a visit with your dentist in Chester. They’ll talk with you about your whitening goals as well as any oral health concerns or conditions you may have. After that, they’ll make a recommendation that’s most appropriate for you. Our dental office in Chester is here to help you get a smile you love and are proud to show off. We welcome you to call us to schedule an appointment.